CDC Whistleblower statement: “My name is William Thompson. I am a Senior Scientist with the Centers for Disease Control and Prevention, where I have worked since 1998. My concern has been the decision to omit relevant findings in a particular study for a particular sub­ group for a particular vaccine. There have always been recognized risks for vaccination and I believe it is the responsibility of the CDC to properly convey the risks associated with receipt of those vaccines.” Congressman Bill Posey’s office has confirmed exclusively to Benswann.com that a “very large number” of documents have been turned over by CDC scientist, Dr. William Thompson, who has admitted that the CDC suppressed information about the links between the MMR vaccine and autism in some cases. Journal Pediatrics did in fact omit important information from a study on the link between vaccines and autism. This is not the first time either. It would seem to be directly connected to the recent release of documents CDC documents and admissions by CDC Government researcher William Thompson. A recently released memo from 2004 of Dr. Thompson expressing concerns to Dr. Gerberding, the head of the CDC at the time, about this problematic study has citizens upset. Does this mean Dr. Gerberding could have committed perjury during a congressional hearing? More investigation will be needed to know. 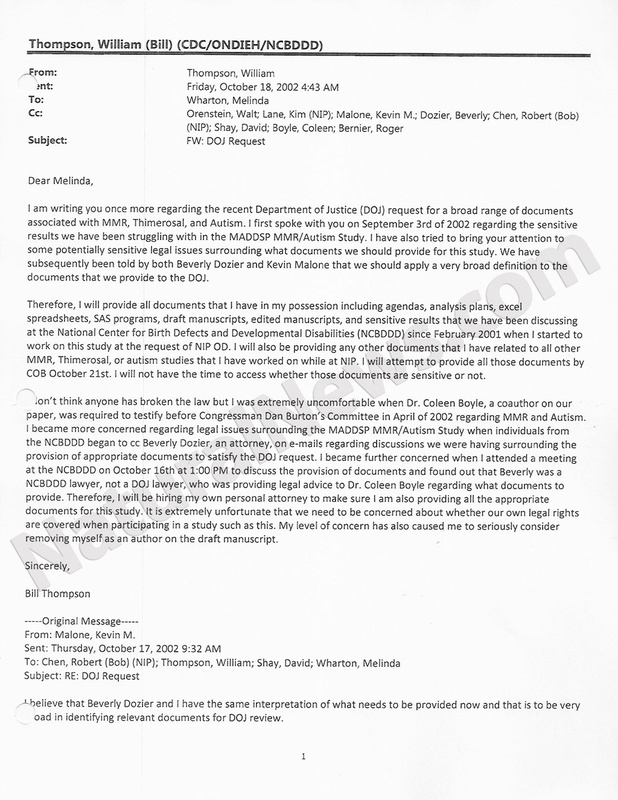 A copy of the letter obtained under FOIA can be found here. Regardless many citizens view this as a deliberate malfeasance at the taxpayers’ expense have begun a social media blitz to inform others of this story as it unfolds. Using the Twitter hashtag #CDCwhistleblower. Parents are hoping to have the agency held accountable for its role in any cover-up and are demanding an investigation on whether Dr. Coleen Boyle also perjured herself in testimony before Congress when addressing concerns of a potential vaccine-autism link. There is a problem with this statement as the CDC could have still gotten the needed data from out-of-state birth certificates, They would have had those in the school records as with the kids born in Georgia. So saying they could not get the data on mothers occupation and birth weight is false in and of itself. not increase the risk of autism”. The Studies that the CDC uses to confirm no link between the MMR and autism are 4 that they list on their website at (http://www.cdc.gov/vaccinesafety/Vaccines/MMR/MMR.html). A quick look at these 4 studies raises several questions.